To remove heavy grout haze from porcelain or ceramic tiles or grout haze that is older than 10 days old. 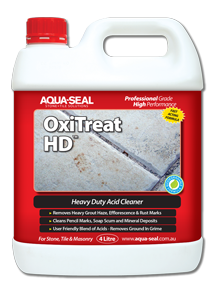 OxiTreat HD is a fast acting concentrated acid treatment utilising an AQS Heavy Duty formula to remove most cement &grout haze, efflorescence, rust stains, mineral deposits, mortar residue & smears. Will help remove most hard water stains,lime deposits, soap scum and ground in dirt and grime. It will also etch concrete. USE: On ACID RESISTANT surfaces. AquaBug Cleaning Kit, Scrub pad or brush, broom, bucket, clean water and cotton towels. Optional: Scrub machine, wet-dry vac. May slightly dull some polished calcium based surfaces e.g. marble, limestone, travertine. a) LIGHT: Dilute 1 part OxiTreat HD to 15 parts clean water. b) MODERATE: Dilute 1 part OxiTreat HD to 10 parts clean water. d) EXTREME: Dilute 1 part OxiTreat HD to 3 parts clean water. Allow minimum dwell time of 10 minutes. Longer dwell time may be required. Note 1: Heavily soiled areas may require longer dwell time and/or stronger solution. Note A: Do not use OxiTreat HD on marble, limestone, travertine or on other acid-sensitive tile or stone. Note B: Use MicroScrub to remove grout haze from polished natural stone & acid sensitive surfaces – see Problem Solver #3. For additional options, please contact Aqua-Seal STS Technical Services via e-mail sales@aqua-seal.com.au or +61 2 9521 4000 with information specific to the problem you are addressing. These recommendations are intended as general guidelines for Problem Solving. The actual product dilution ratios and cleaning requirements may vary depending on the use, amount and method of application. Read entire Product Label, SDS and Technical Bulletin before using any product. ALWAYS TEST A SMALL AREA to determine the ease of application, dilution, dwell time & desired results. Keep surface clean and dry to reduce possibility of slip-fall accidents.